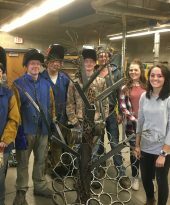 This sculpture was created by a collaboration of skills and ideas by students in Advanced Metal Sculpture Class at J.W.P. High School. The artwork represents a rebirth of life from a cold, dark world.